Is your portfolio company data collection and reporting painfully inefficient and resource-intensive? With today’s technology, it doesn’t need to be. As limited partners seek higher standards of transparency and increasingly complex and granular information on portfolio companies from their general partners, the days of hand-collecting and copying and pasting data are numbered. Where once, providing updates to LPs may have been a relatively straightforward exercise involving aggregated information from a handful of companies, the whole process has become more complex as the private equity industry has matured. With more funds under management, plus different product types, such as co-investments, separate accounts and investments in other alternative strategies, reporting back to investors (and analyzing data for the firm’s own monitoring purposes) has become a major headache for many. 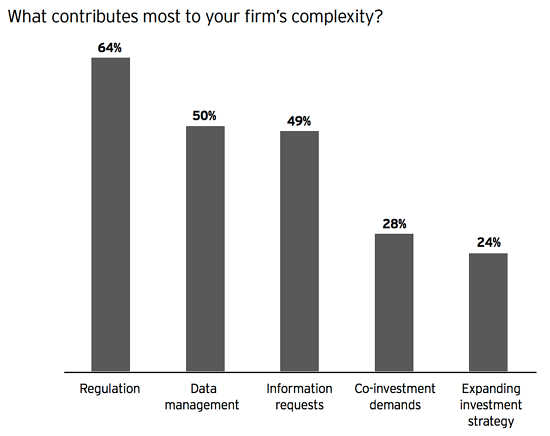 Indeed, recent EY research found that 50% of private equity firm CEOs said that data management contributed to complexity in their firm and 49% said the same of information requests. Despite these trends, for too many firms, the reporting process - from collecting data from portfolio companies and analyzing it for their own performance monitoring and to comply with relevant accounting standards through to presenting it in a form that LPs can use and analyze themselves - remains manual and highly resource-intensive. At many houses, this has meant adding cost by hiring more personnel to manage information flows or wasted resource in the form of tying up investment professionals in work they are not best equipped to do. Others have opted for outsourcing back-office operations lock, stock and barrel to one or more third-party administration providers. Yet these are not always the right answers to the problem. Nearly four-fifths (79%) of firms surveyed for the EY report, for example, said that substandard service level and quality was a constraint to outsourcing, while 68% said that most third parties were unable to manage complexity. But what if you could continue to use your own people while making the process more efficient and streamlined? With rapid advancements in technological capability over recent years, the answer is already here: automation. And if this is not an option you have already considered, you can be sure that many of your competitors are looking closely at how they can achieve this. 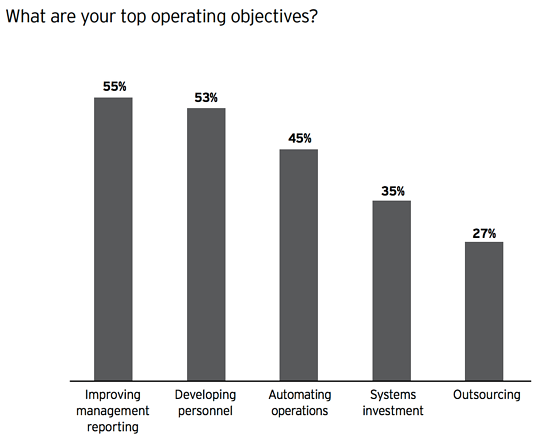 Nearly half of CFOs in the EY study (45%) consider automating operations as a top operating objective. Private equity firms no longer need to request information individually from portfolio companies or chase late filings as an automated system alerts funds when a report is filed or becomes late and it can provide built-in reminders for companies to file on time. Automated portfolio reporting can also unify and standardize the data collected, so that private equity houses don’t have to deal with information coming their way in different formats. With information flowing directly onto the platform, automation also obviates the need for data input, saving time as well as reducing the scope for human errors in reporting and financial filings. And, once portfolio company reports are filed, firms can easily analyze the data for their own monitoring purposes. The best platforms can automatically translate financial data into visual reports and dashboard information, making it easier to track progress according to their own, pre-set KPIs. They also allow firms to personalize and brand reports so that communication with LPs is seamless and consistent with the way they wish to present the data. And finally, information can be easily tailored to meet individual LP requirements without the need for time-consuming spreadsheet analysis and data formatting. The whole process doesn’t just result in faster, more efficient information flows, it results in better data all round. Automation has the power to transform portfolio company reporting and analysis, with the benefit of freeing up investment professionals to originate and complete deals and to track portfolio company progress, value, leverage, job creation and many other performance metrics in granular detail with just a few clicks. And the good news is automation doesn’t have to mean costly and time-consuming investments in IT. At Hockeystick, we have developed a cloud-based platform that meets the unique reporting and performance measurement needs of private equity firms, portfolio companies and fund investors. We offer the future of reporting today. So, if you’re still stuck in the realm of copy and paste, it’s high time you moved to the future.